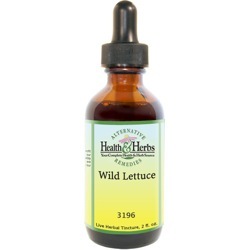 Wild Lettuce has been considered to be a mild sedative that is known to calm the nerves, treat restlessness, anxiety, severe nervous disorders, neuroses, and has often been used to induce sleep, and treat insomnia and hyperactivity in children. Because it is soothing to the digestive system, it has also been helpful for colic. Ingredients: Wild Lettuce Leaf, Structured Water, 20% Alcohol. Non-Alcohol: Wild Lettuce Leaf, Structured Water, Vegetable Glycerin. From candra conner of loxahatchee, Florida on 8/27/2012 . From Anonymous of Lehigh Acres, Florida on 8/16/2012 . From Anonymous of Horn Lake, Mississippi on 4/27/2012 . From Anonymous of Berkeley, California on 4/10/2012 .